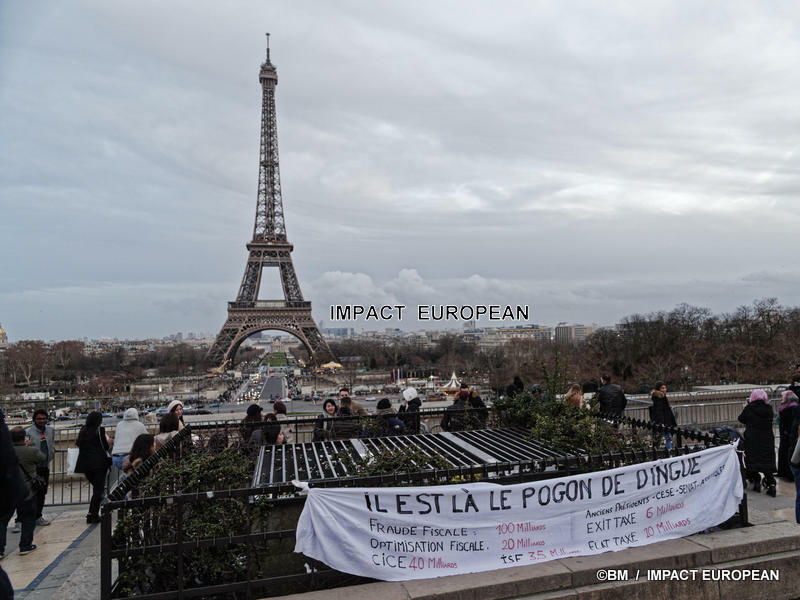 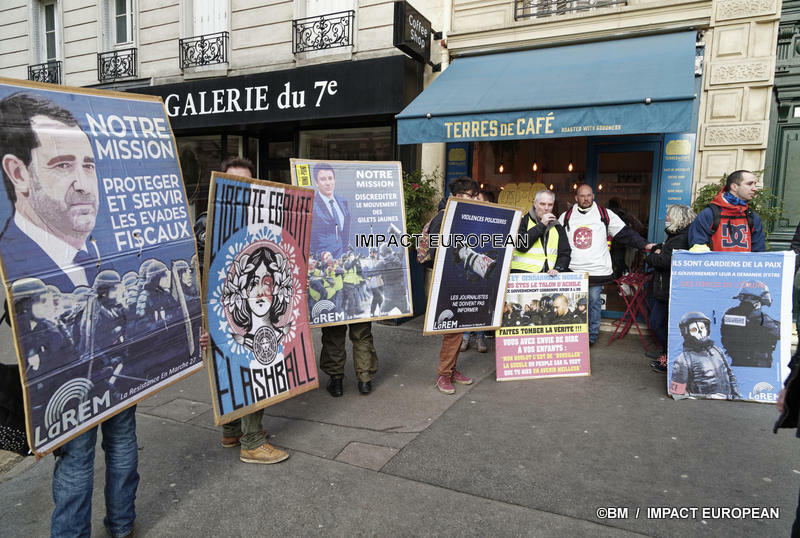 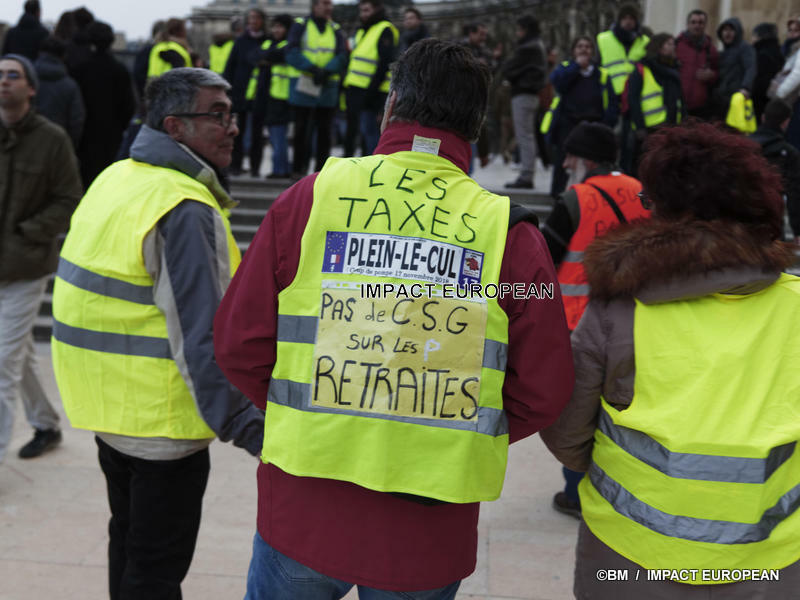 Mobilization decreases overall every Saturday since mid-January, according to Beauvau figures: January 19, the number of “yellow vests” reached 84,000, they were 69,000 on January 26 and 58,600 February 2. 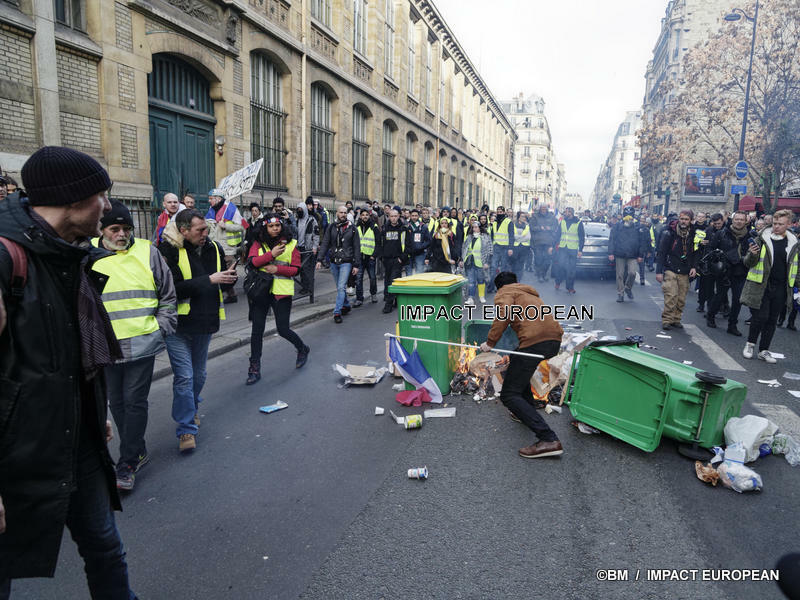 In the capital, incidents occurred when the procession arrived in front of the National Assembly, where a protester in his thirties had a hand torn off. 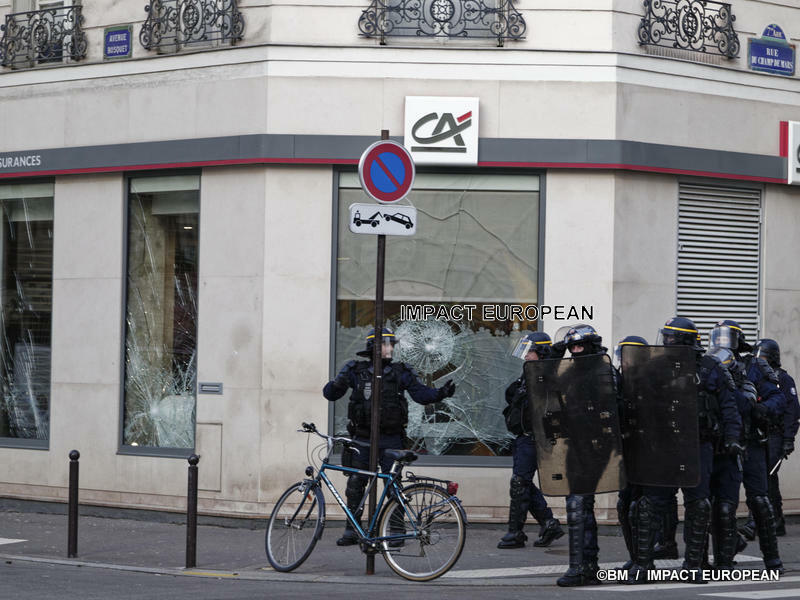 According to the police headquarters, he had “four fingers torn”. 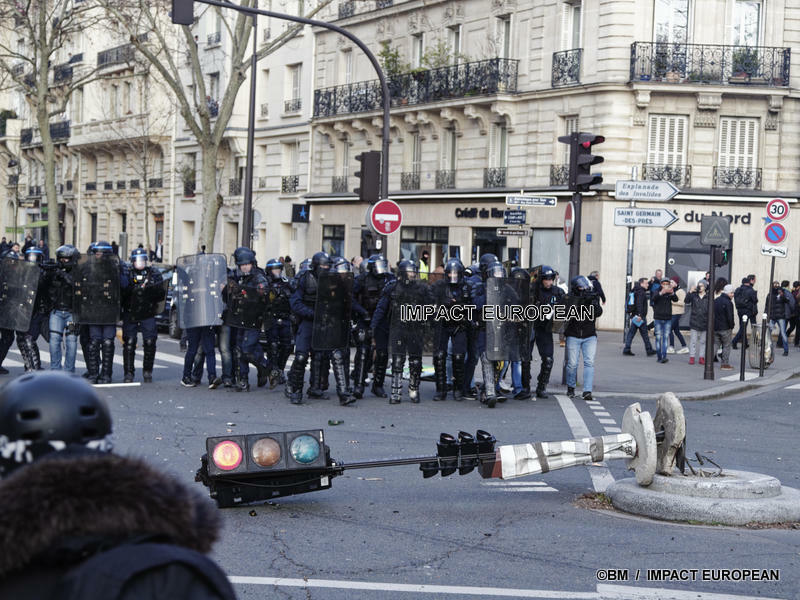 The cause and the circumstances of the injury remain uncertain. 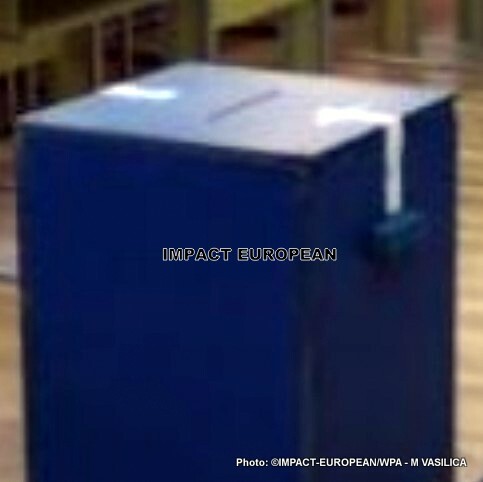 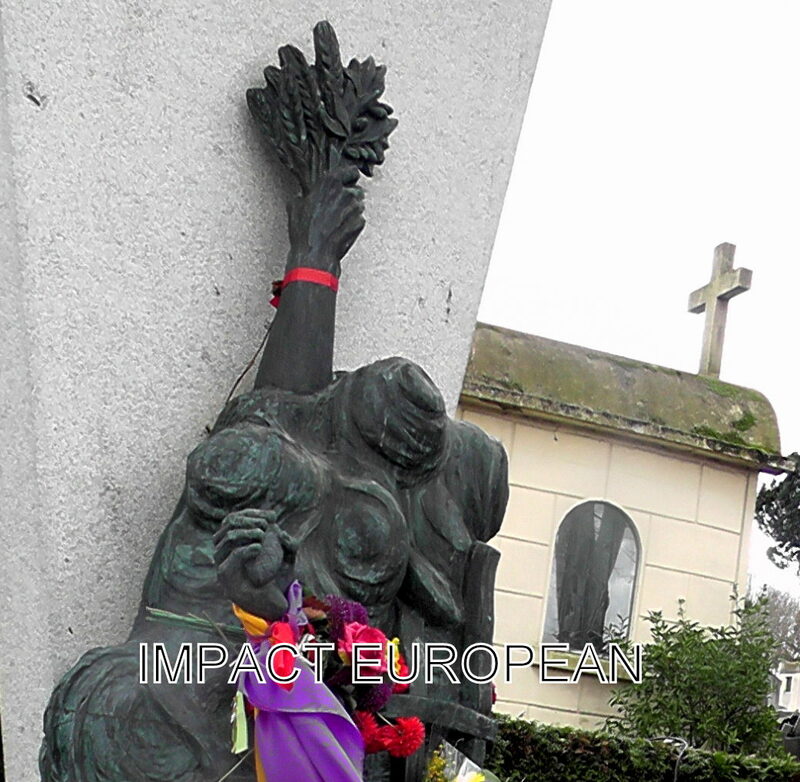 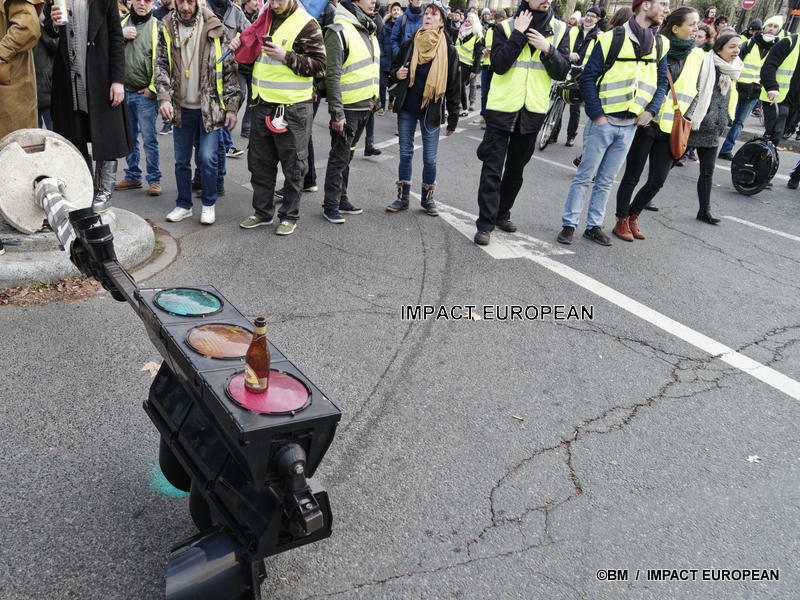 According to a witness, this is a “de-encircling grenade”, launched by the police and that the 30-year-old wanted to fend off a “hand”, while demonstrators were trying to drive the palisades protecting the Assembly. 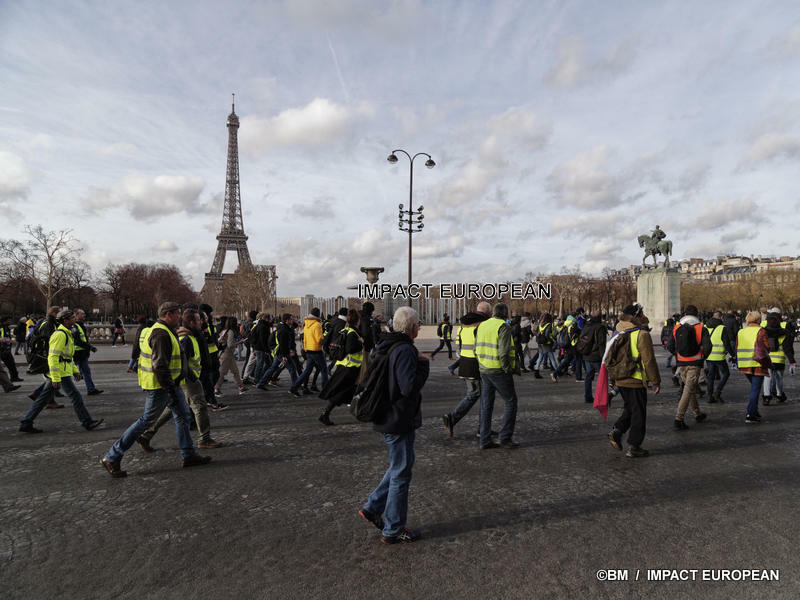 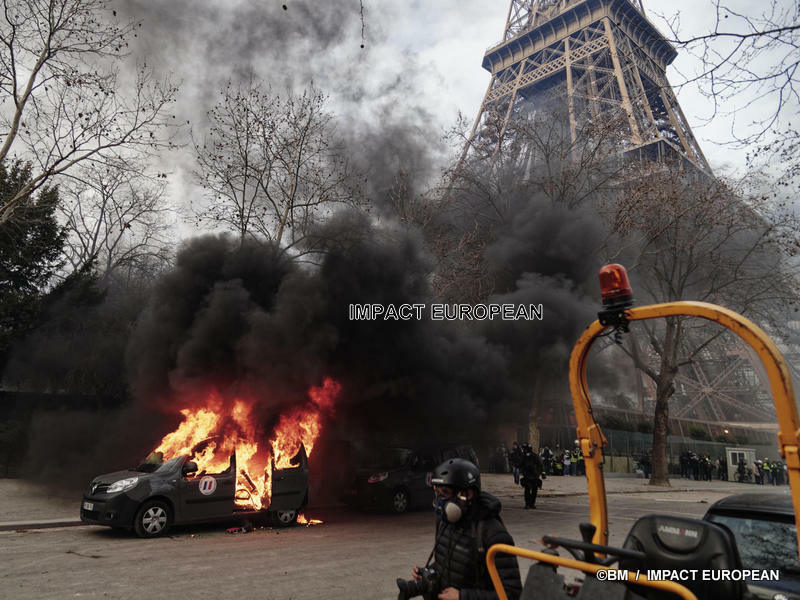 Incidents took place on the course of the event, which arrived around 16:30 near the Eiffel Tower, in a tense atmosphere, and ended before 20 hours after dispersal by the police, which remained present, like every Saturday, on the Champs-Élysées. 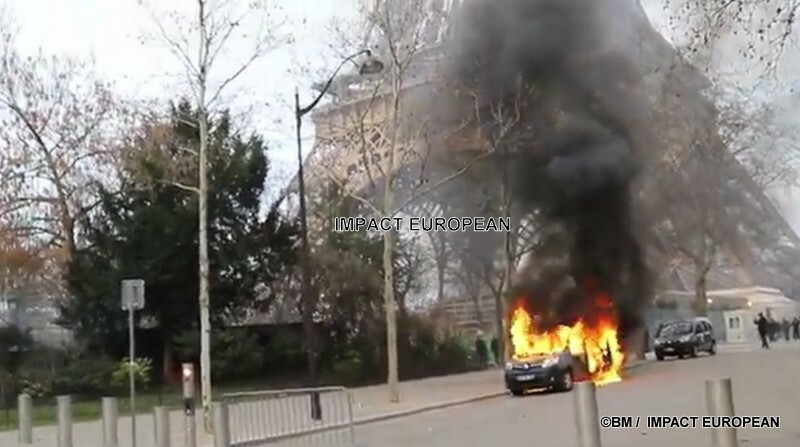 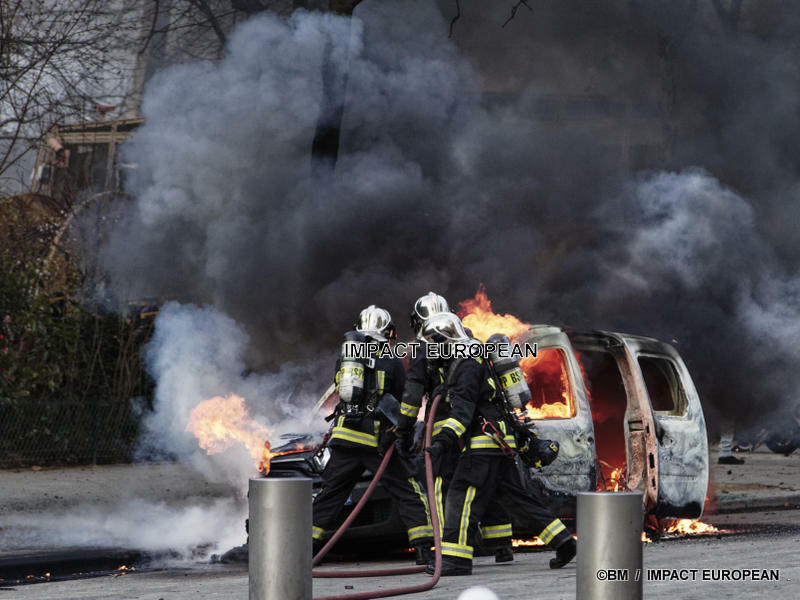 Street furniture and bank machines were broken, a dozen vehicles burned, mainly luxury cars but also a car of the Military Sentinel anti-terrorist mission. 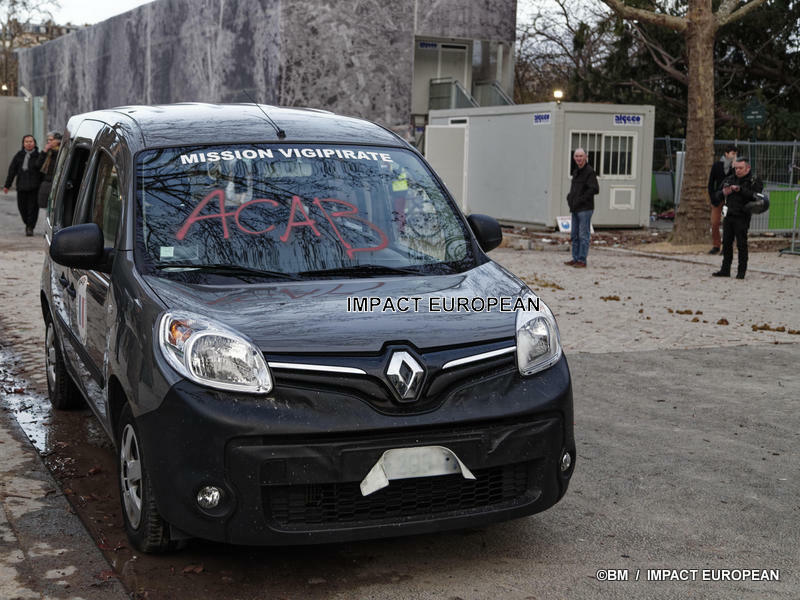 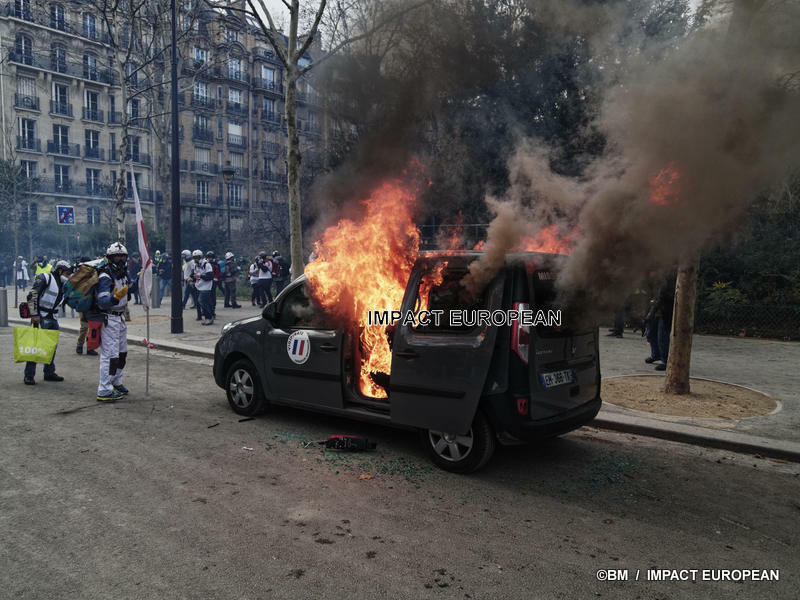 Reacting to this latest incident, Interior Minister Christophe Castaner denounced on Twitter “intolerable attacks” and expressed his “indignation and disgust”. 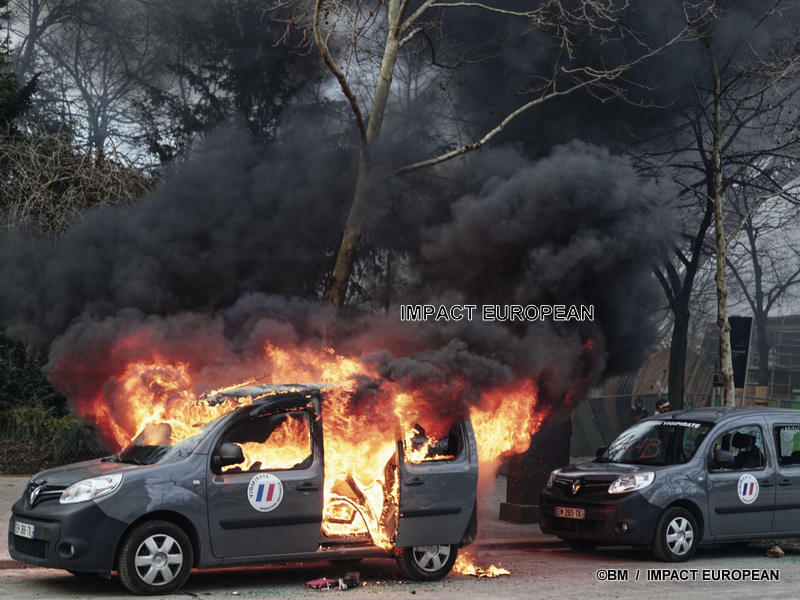 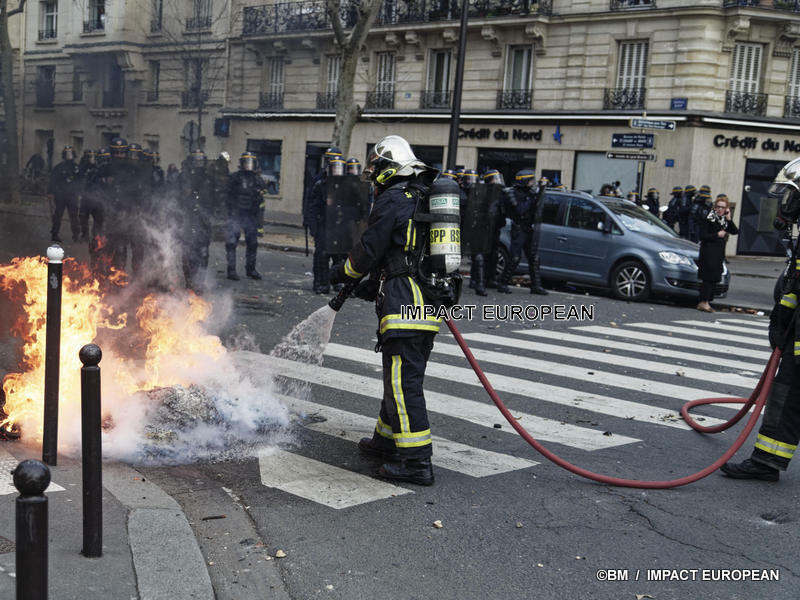 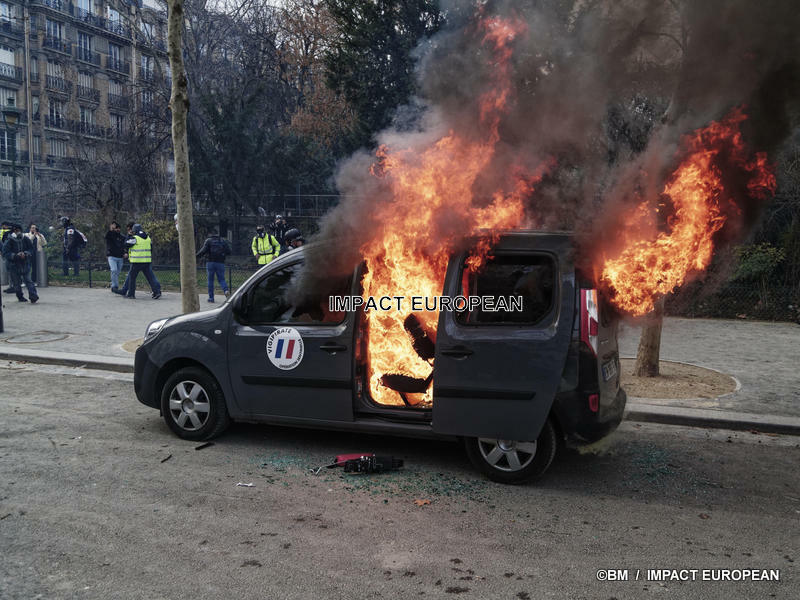 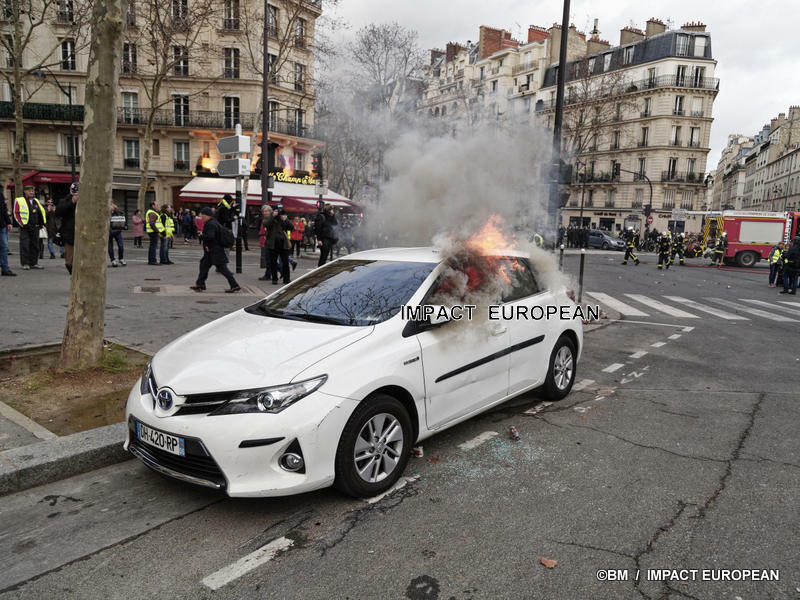 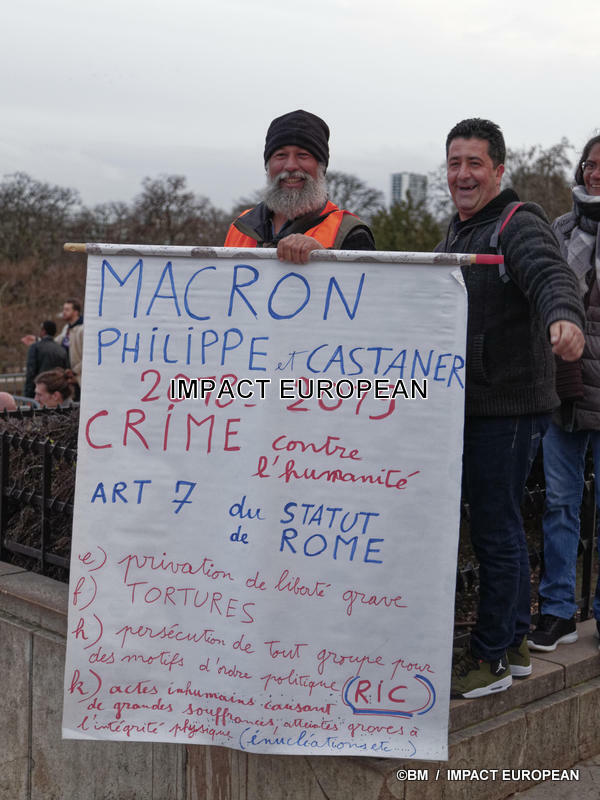 The Paris public prosecutor’s office announced in the evening that a man had been taken into custody as part of an investigation opened for “destruction by fire of a property of public utility”. 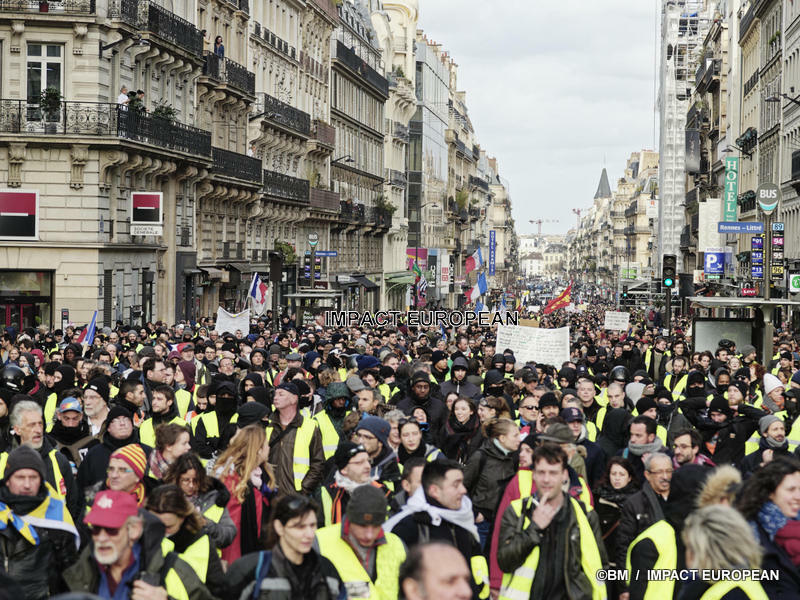 In Bordeaux, several thousand “yellow vests” held rallies, often enamelled clashes. 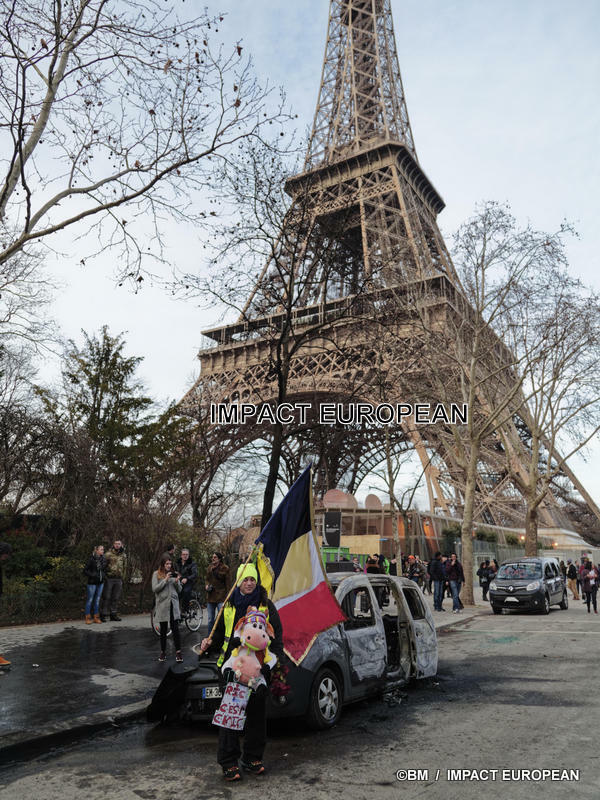 In the procession floated many French flags, and a black anarchist flag, behind banners proclaiming: “On the road to a better world”. 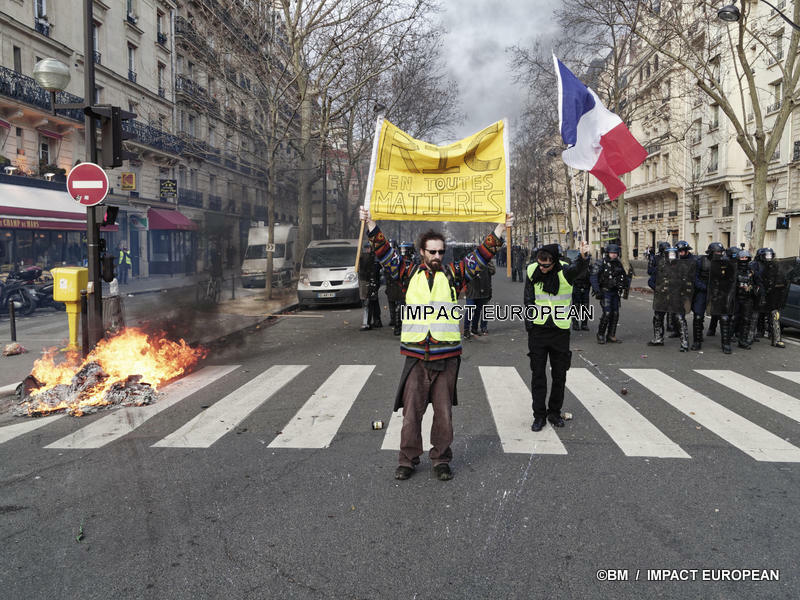 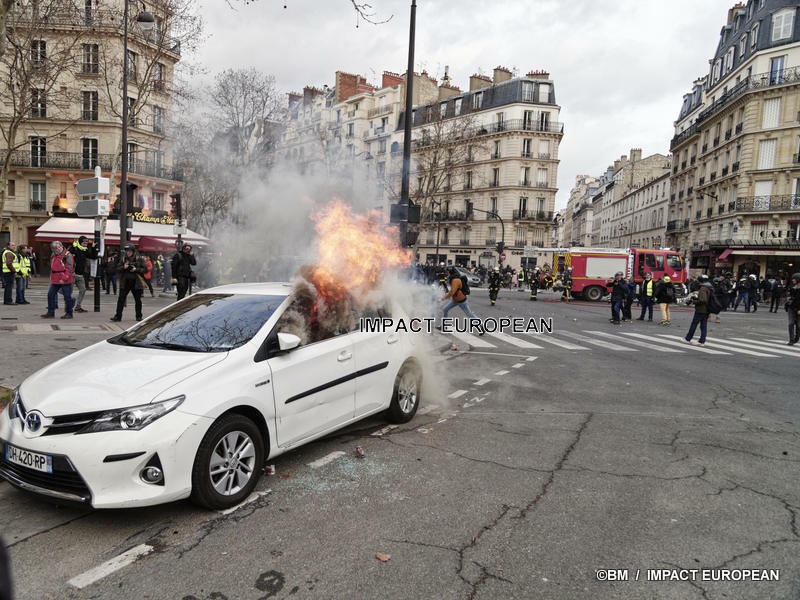 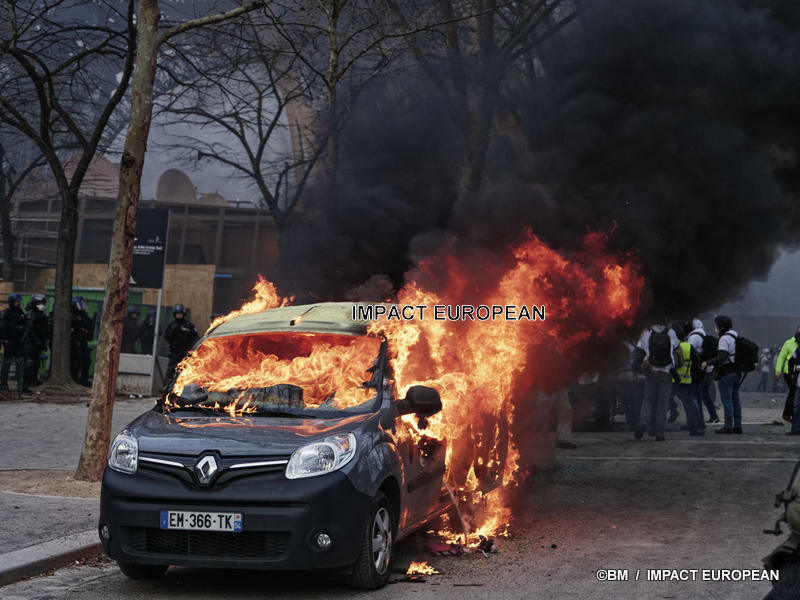 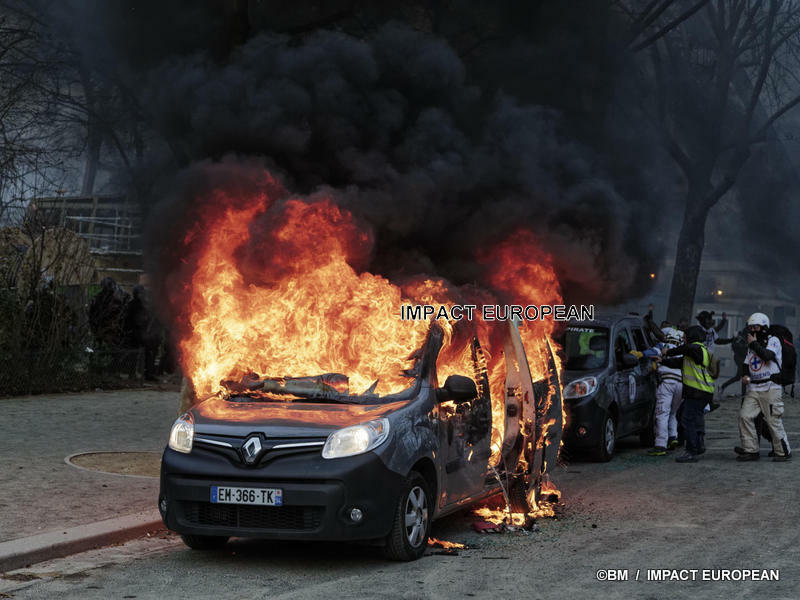 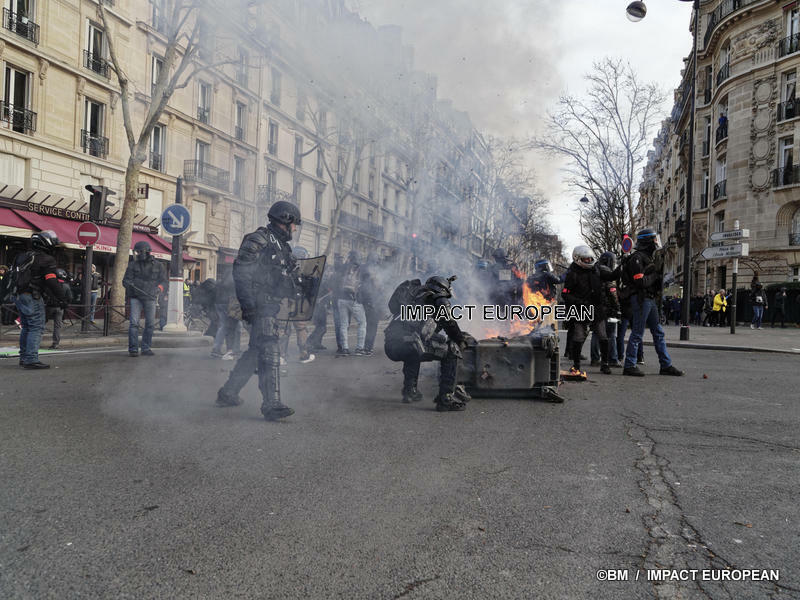 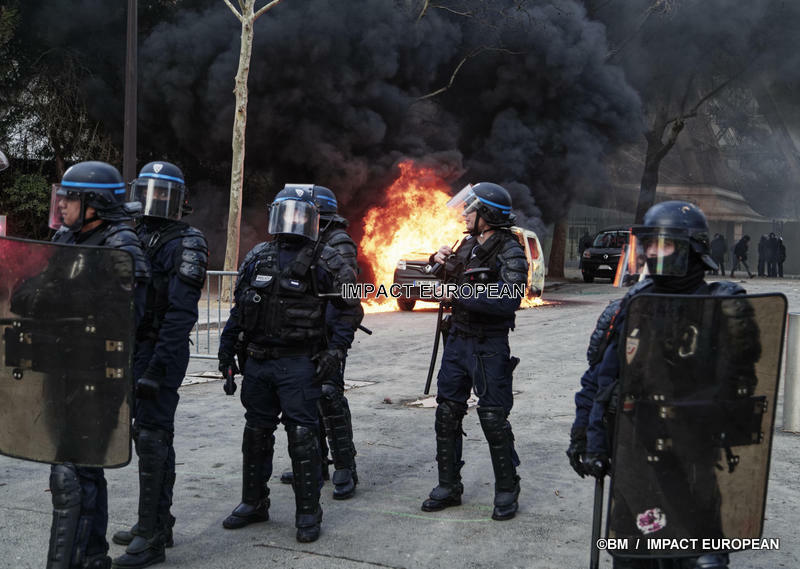 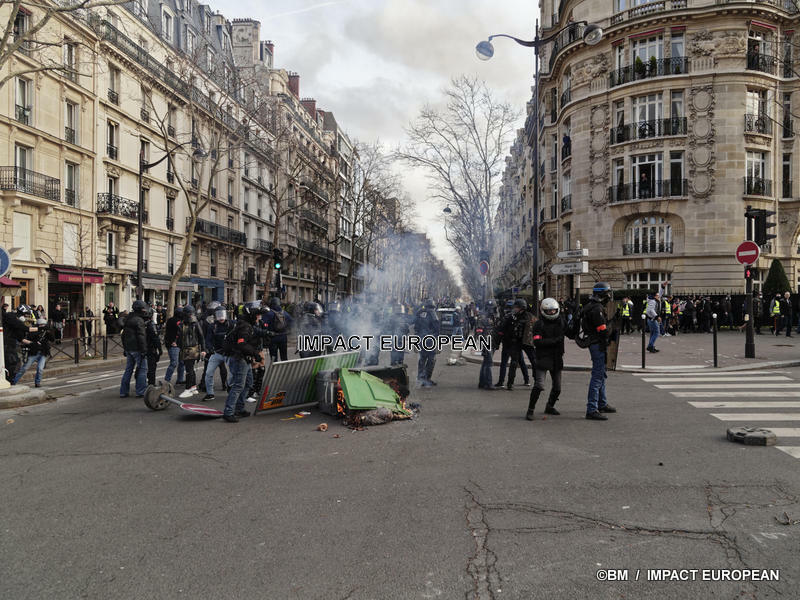 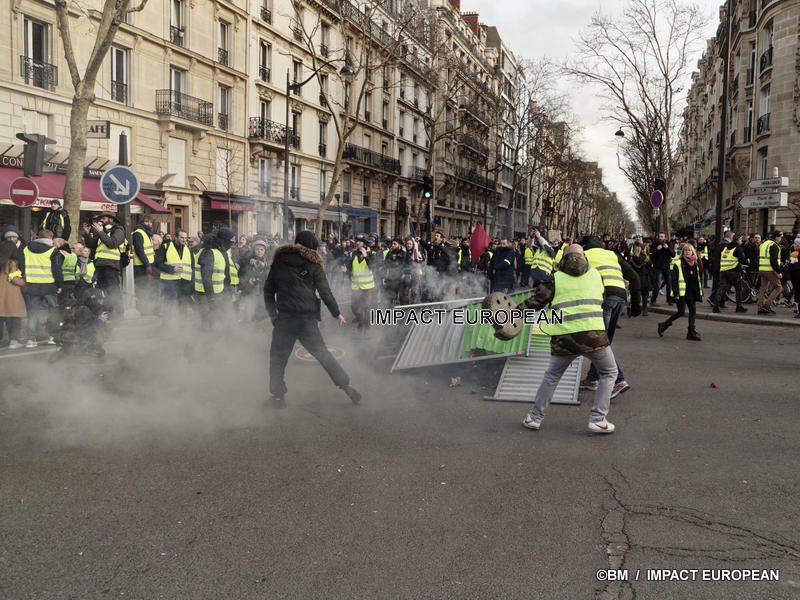 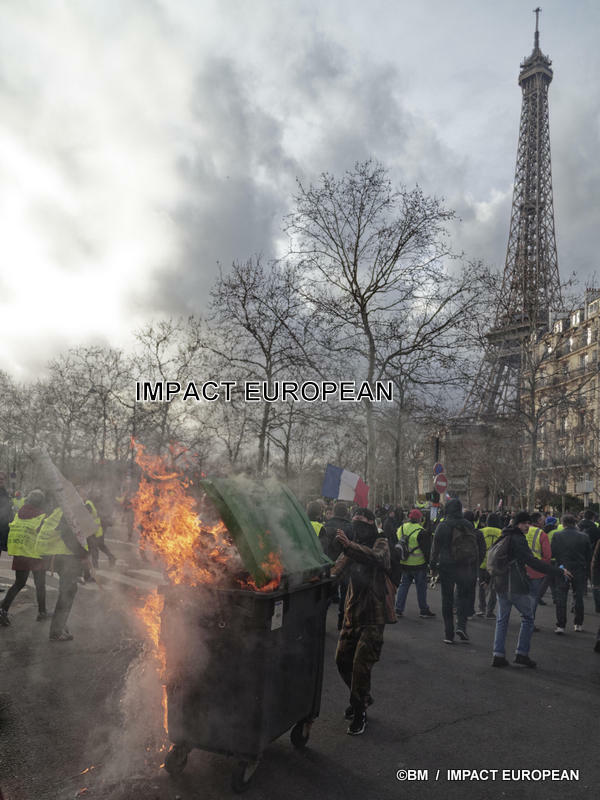 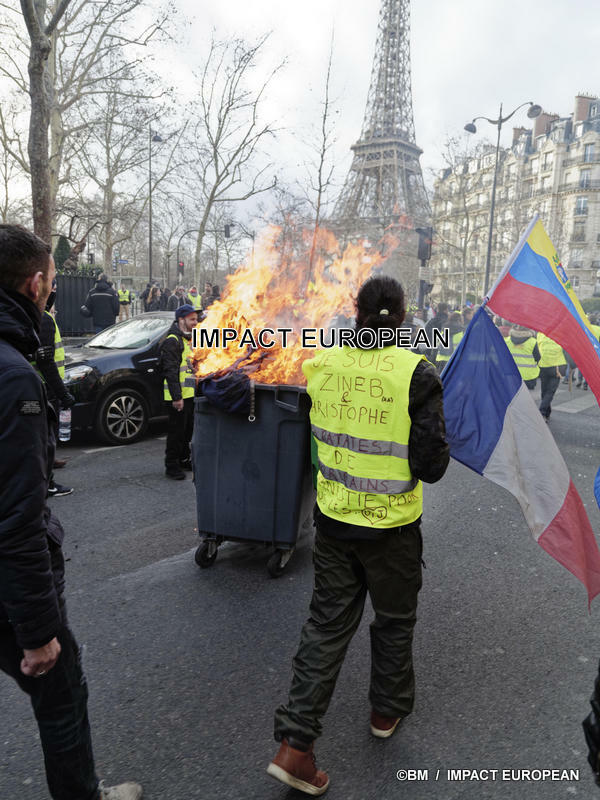 In Lyon, clashes on Saturday against “yellow vests” and police, which have several times prevented the procession of demonstrators from entering the “peninsula”, the shopping node of the hyper-center Lyon. 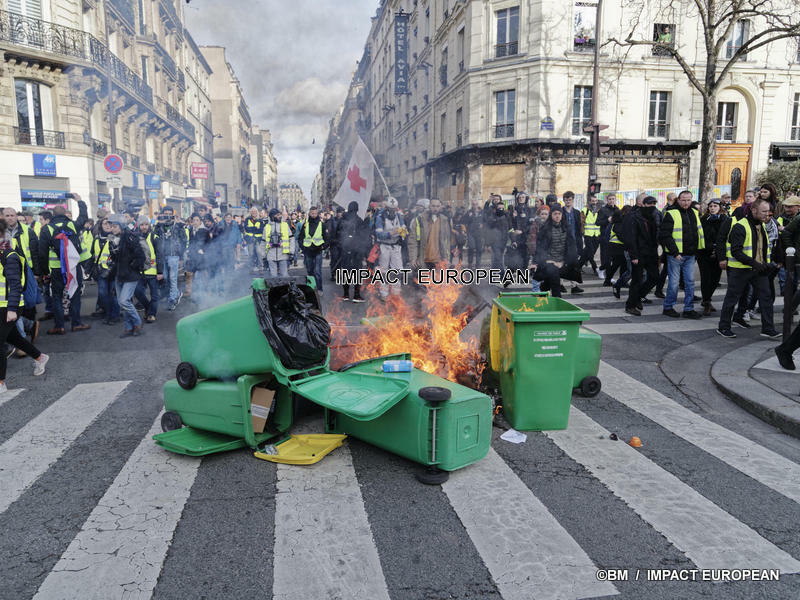 Tensions erupted in Paris, Toulouse and Rennes, but dozens of demonstrations, elsewhere in France, have instead proceeded calmly. 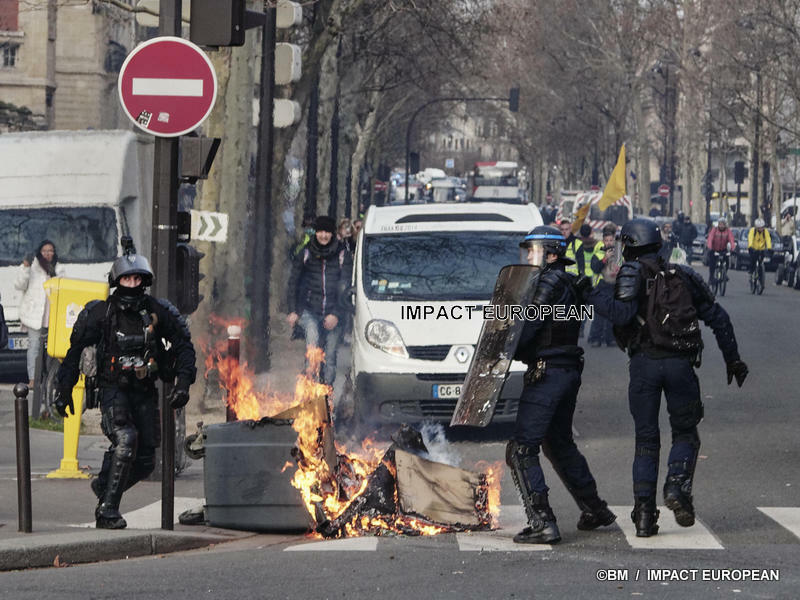 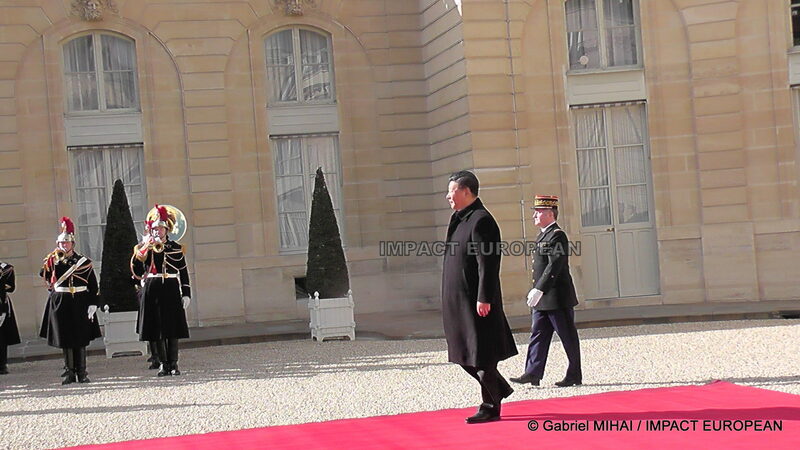 At 19:00, the Interior Ministry announced 51,400 demonstrators in France, including 4,000 in Paris. 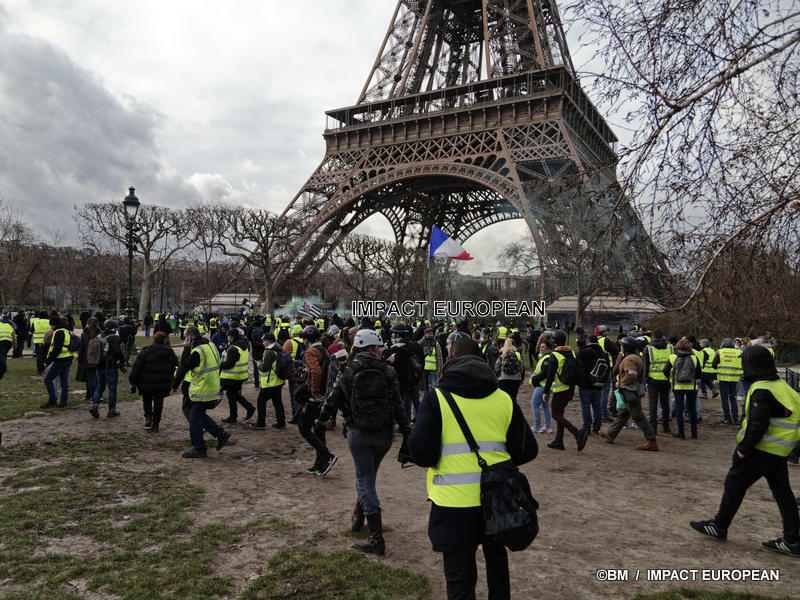 During the last two Saturdays, the mobilization was down, with less than 60,000 protesters, a figure challenged by the movement that claimed twice as much.